VHF-FM fTiarine radiotelephone is on hand. Whether you're in your tender, in a dinghy, working around your boat, or out in your day saileriThere's no installation hassle, no need to slop what you're doing to make or receive a call, and when you leave the boat your CTX-|078 leaves with you, clipped to your belt. 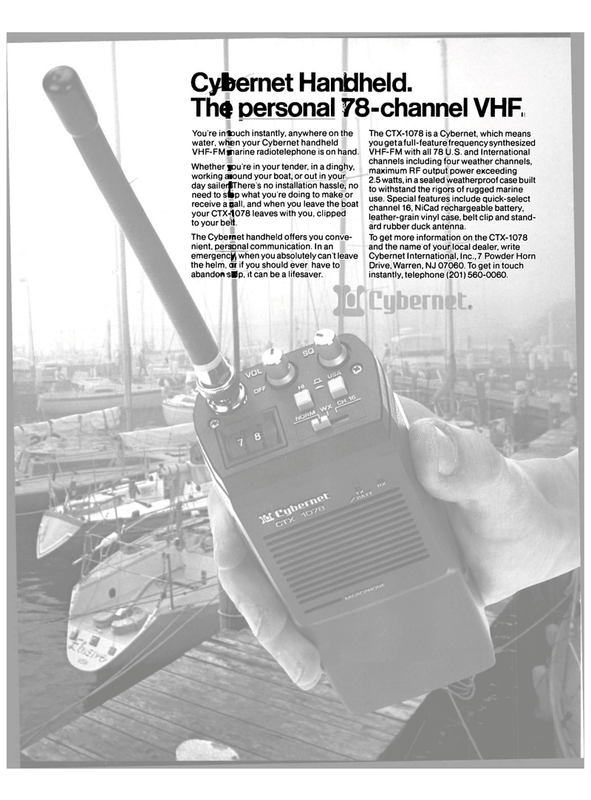 The Cybernet handheld offers you conve- nient, personal communication. In an emergency when you absolutely can't leave the helm, or if you should ever have to abandon slip, it can be a lifesaver. VHF-FM with all 78 U.S. and International channels including four weather channels, maximum RF output power exceeding 2.5 watts, in a sealed weatherproof case built to withstand the rigors of rugged marine use. Special features include quick-select channel 16, NiCad rechargeable battery, leather-grain vinyl case, belt clip and stand- ard rubber duck antenna. Drive, Warren, NJ 07060. To get in touch instantly, telephone (201) 560-0060.